I went through a serious, unhealthy Groupon phase. For those that don’t know, if you go to groupon.com and sign up you get coupons to so many different things in your area. The coupons range from outdoor activities, home supplies, food, and anything else you can imagine. The best part was when I realized that every once in a while Groupon offers coupons on food classes. I’m already signed up for a Truffle Making Class in January (yummm, expect that to be a wonderful post). 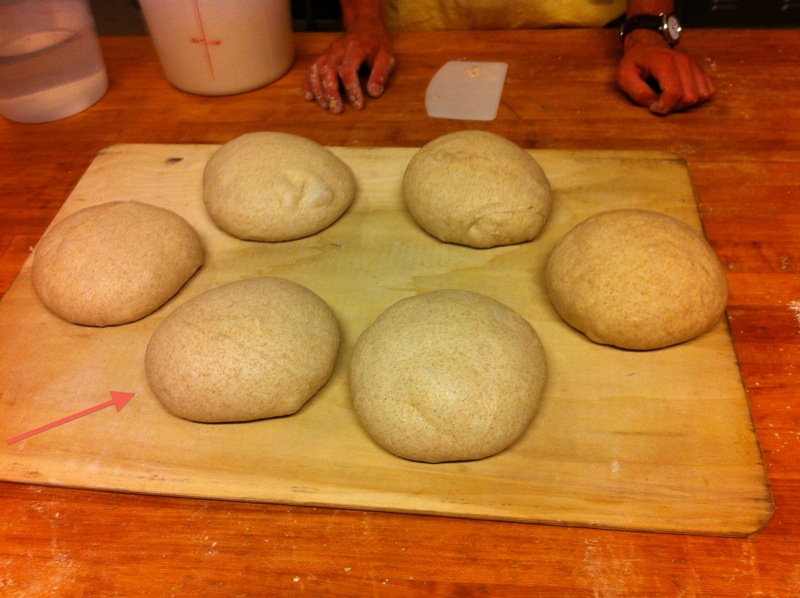 But the first class I went to was a bread making class, specifically titled “Dough Development”. Since my goal is to up my baking levels, I figured learning how to make my own bread would be a great step. I have to tell you that the Truffle class is going to have some stiff competition, because this is one of the BEST classes I’ve ever taken. Regular store bought bread seems so dull compared to the bread I made .It was done by a San Francisco company called Sour Flour. They share a kitchen with a lot of different restaurants, so it was hard to find the place at first. But I am so glad I did. The teacher was amazing. He knew exactly what he was doing and was able to show each of us exactly how to stretch and fold our dough. The class was small so you could get individualized attention. As soon as I earn some extra funds, I’m going back to learn how to make my own starter (which once I do, I will certainly post about). A starter is just flour and water that gets “fed” (adding more flour and water. While it seems super simple, it becomes a much more complicated process to figure out how much water versus flour you add. Until then, Sour Flour sells starter and I’ll have to buy starter from them whenever I want to make bread. 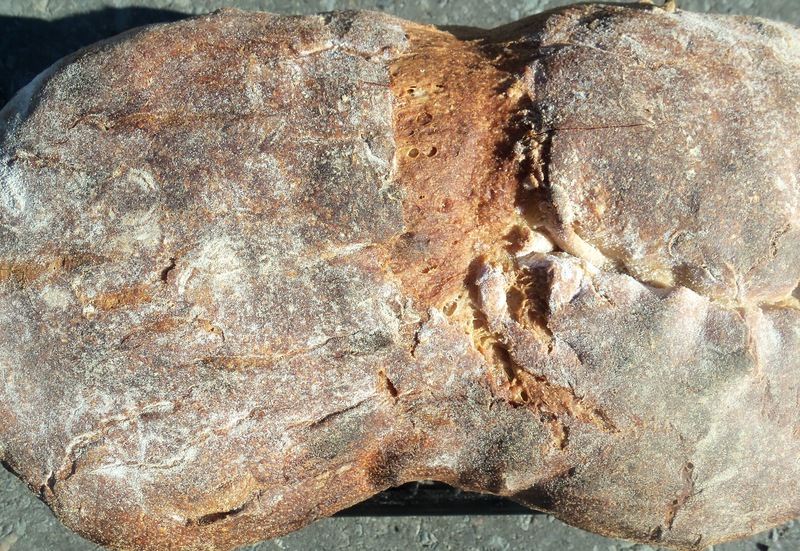 The ingredients to make the bread are incredibly simple: flour, water, starter and salt. You can’t forget an ingredient. But the technique was what was focused on in this class. I’ll try to explain it the best I can for everyone. While these are the measurements when using our standard cups and teaspoons, if you want to measure out the ingredients with a scale, the volume measurements are not the same. We were told that our standard bread usually has 70 grams of water for every 100 grams. For heavier bread (i.e. bagels) there would be less water, while with lighter breads (i.e. foccaccia) there would be more water. 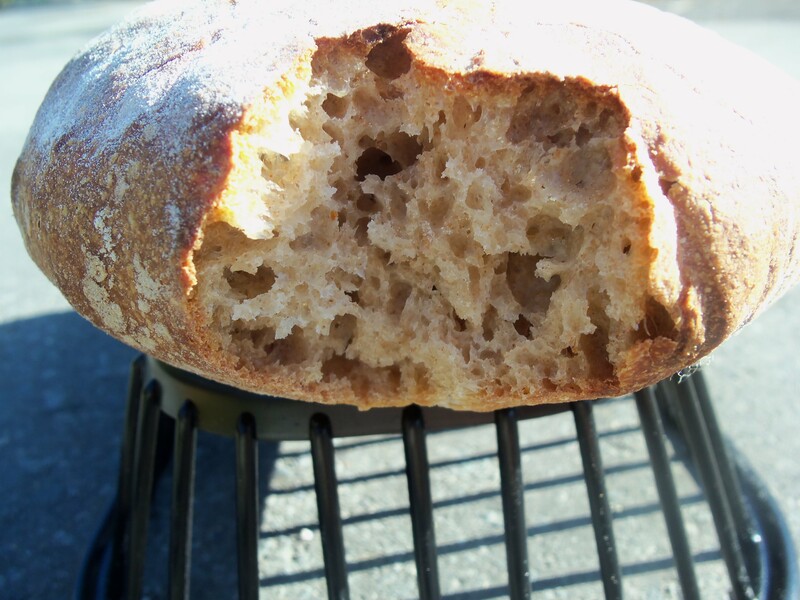 There is no exact formula, but the point is to play around with the different types of bread you can make. After we had all of our ingredients, we started out with the two cups of flour on our table. We pushed the flour around to make a circular barrier to pour the starter, salt and water in (see the picture below, it’s harder to explain than it actually is). Next we combined our ingredients. There was no magical trick to this. After we had the starter and water in the middle of the flour barrier, we just began incorporating it all together with our fingers. Making circular motions around the flour barrier and slowly incorporating the flour into the water. Eventually, it will be safe to just move all the flour into the water. If you have a wetter dough, it will incorporate a little faster, while stiffer dough (such as bagels) will require more incorporation to get the flour all worked in. At this point I would taste the dough and decide if you need a little bit more salt. Chances are you don’t need a large amount. The dough will taste semi bland, but you just want a little bit of flavor for now. If you have to add more salt, I would fold and push the dough until the extra salt seems well incorporated. Once you have your dough, let it rest for a 15 minute break. 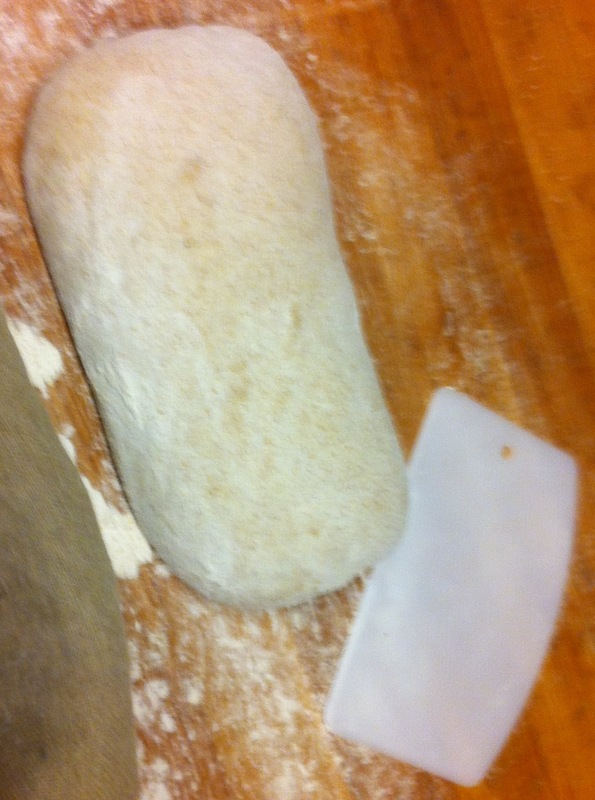 Once you have your dough together and rested, fold the dough in half and then push down on it. Then begin stretching the dough. This is done exactly as it sounds. Start slowly pulling at the edges to stretch the dough. Just do a little at a time, and it will begin to expand. While you want to stretch it out as much as possible, do not pull it so much that it breaks. Small stretches here and there will help prevent that. Fold and push down again. Let rest for another 15 minutes. Then repeat the above steps. We were given these handy shapers (the white plastic tool in the photos). With this we were able to fold and push the dough into the rectangular log shape that we wanted. While they sold these at the workshop, I’m sure I’ve seen them at Target and Bed Bath and Beyond. We just kept pushing and folding under the dough until we got the shape we wanted. Once we got the shape, stop touching the dough. We don’t want to overwork it. I wish there was a magical formula on how to do this, but it really is something you just learn by playing around with it. Once you get the hang of it, it will just click. 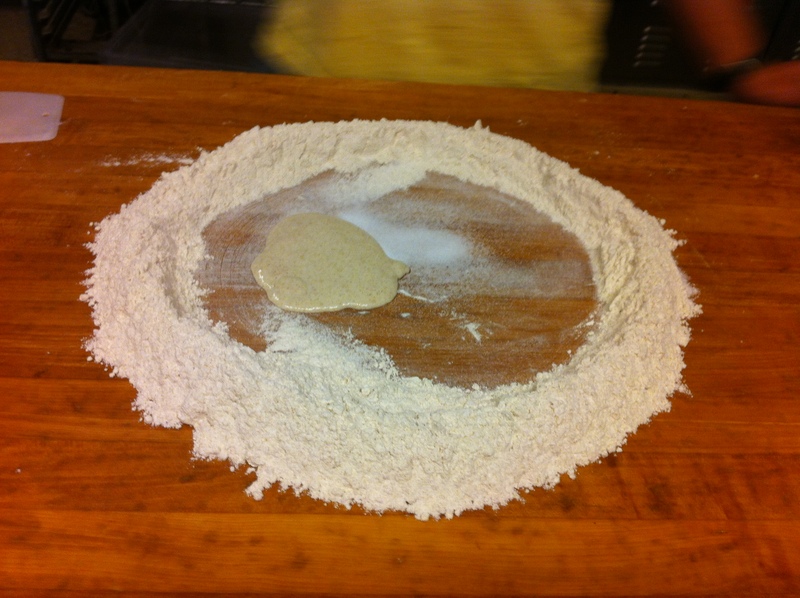 Once the dough is shaped, place it in a linen lined basket (sprinkled with flour) or a floured board, loaf pan or pot. Guess which one is mine? so pretty! 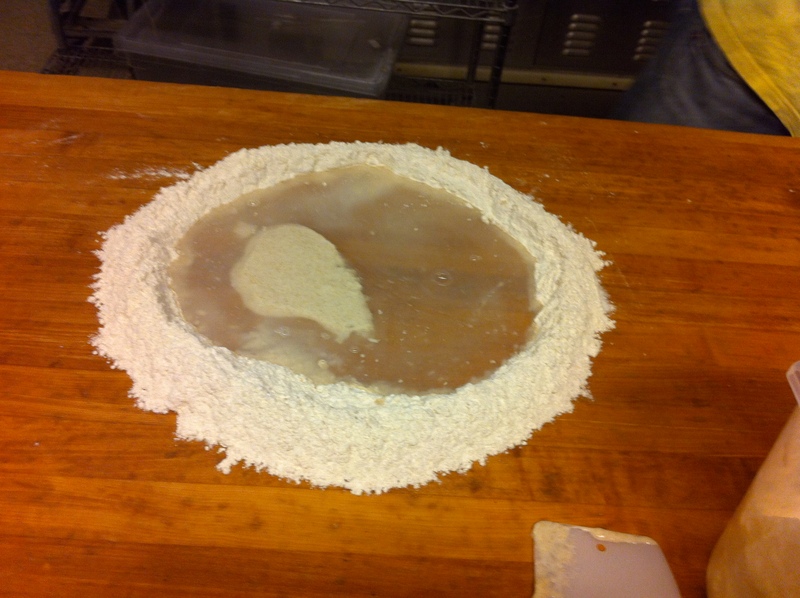 This is the stage where the dough gets its final shape. The dough may grow up to double its size. I covered my dough in my linen lined basket overnight (or about 12 hours, depending on when you start). When it comes to baking it depends on the size of the loaf. If you have a very large loaf you will need to cook on a lower temperature for a longer amount of time. While the smaller the loaf the higher temperature you can use and shorter time. With one loaf of this recipe (2 cups flour, 1 cup water), I cooked mine at 450 degree for about 30 minutes. But this was my mother’s crazy hot oven, so I would recommend what the instructor told me at 475 degrees for about 35 minutes. Make sure to always check your baking. I’ve found that every oven is different. So if it looks done and crisp on the outside at 30 minutes, then it likely is done. One test the instructor taught us is, if you think your bread is ready, take it out of the oven and knock on the bottom of the loaf. If it sounds hallow, then it is ready. If not cook for a little more. While mine came out looking a little burnt, it didn’t taste burnt at all. But you want to make sure it cooks enough so that the inside of the bread is set and not gummy. Let your bread cool for about an hour before cutting into it and eating it. This will also help the inside set. This is what my instructor said, but I cheated just a little because I wanted to taste the warm bread. I pulled one of the ends to taste. Shhhh don’t tell on me! 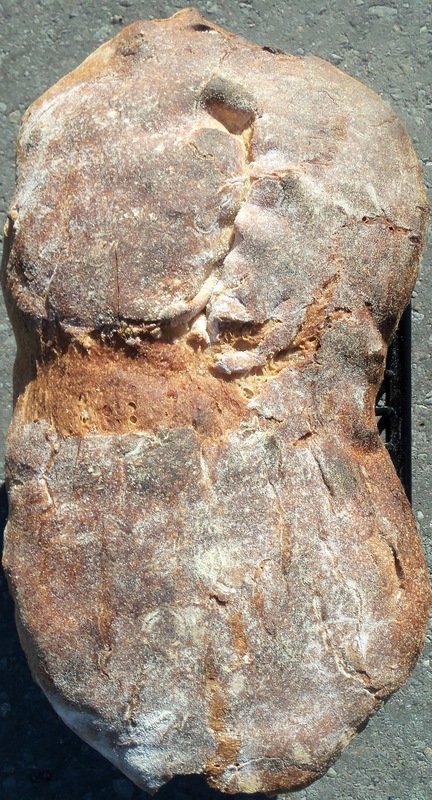 If there is every a national meeting in San Francisco, I will make you your own loaf of bread!